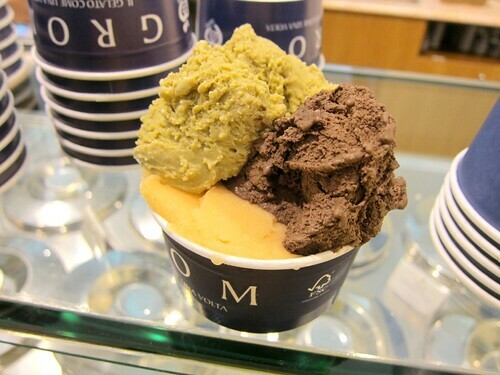 A new gelato shop has landed in Back Bay. 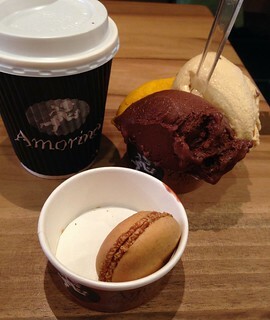 Amorino is a chain started by two Italians - but first launched in Paris - that's making its way around the US. They use a special spatula to scoop your ice cream and promises to let you choose as many flavors as you like, no matter what size you buy. Even all 16 if you want. 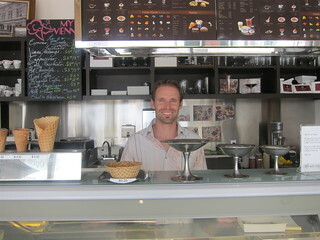 The gelato itself was very good. I tried a bunch and really liked the chocolate (rich and dark, just the way I like it), salted caramel, and the mango sorbet. You can definitely taste that they use real mangoes. 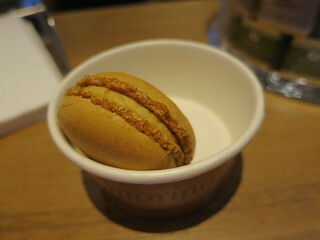 They also have macarons, but not your run-off-the-mill maracons. They're filled with gelato! I've found it. 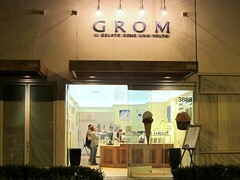 The best gelateria in LA, Grom. Yes, it's a "chain" (from Italy) but this is no Piccomolo. 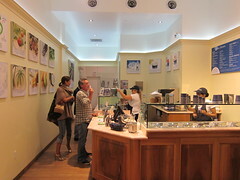 Grom opened in Torino in 2003 to great success and expanded to shops abroad starting from New York City in 2007. 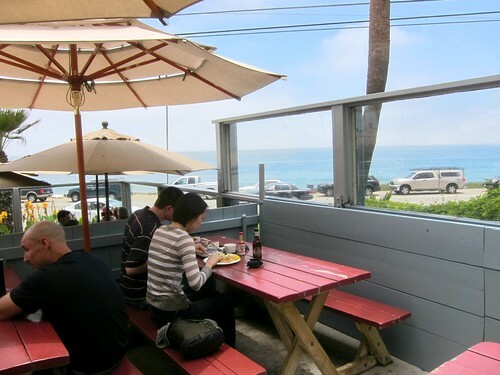 Now it has finally come to LA in a shopping center in Malibu. 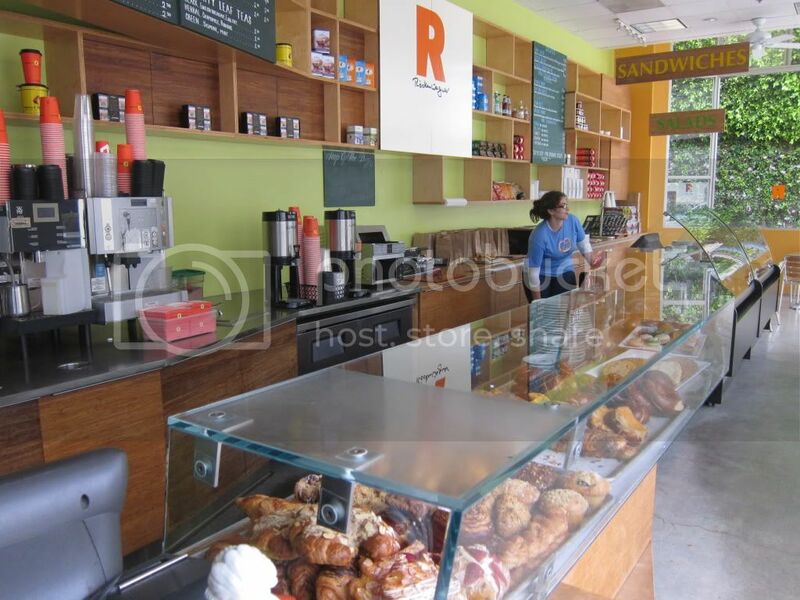 Entering the store, you will notice the pictures of produce hanging on the wall that say where they come from (seasonal fruits, almonds from Avola, pistachios from Syria, chocolates from Venezuela or Colombia). 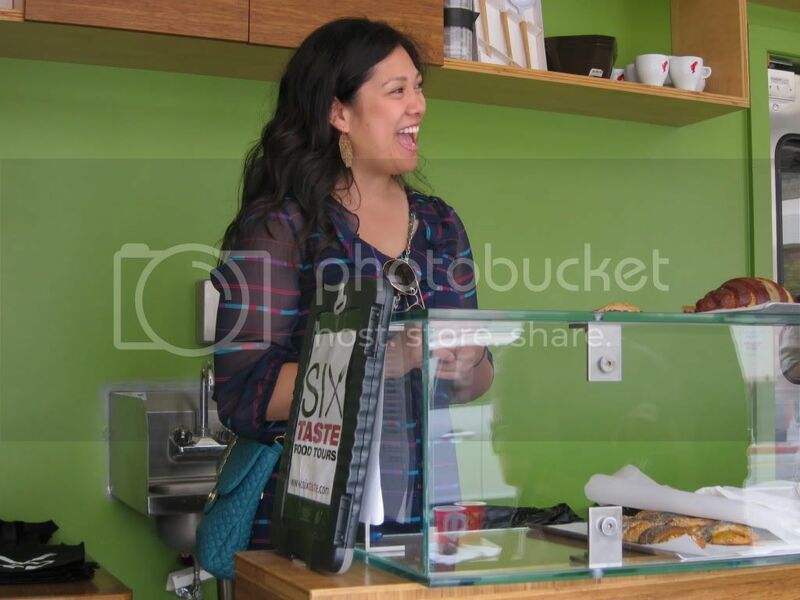 Taste some of the 30 flavors of the day and you will be confounded by the selection. They're just all. so. good. 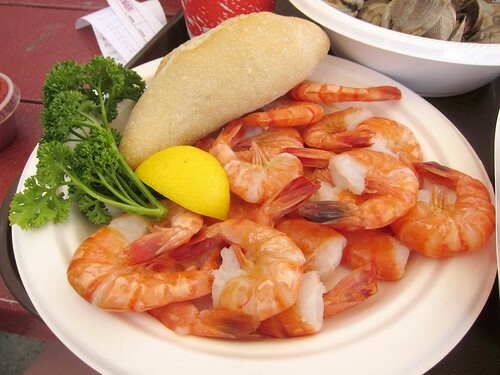 The consistency is dense and creamy, and the flavors of the ingredients come out strong. There's none of those sweet red stuff that only vaguely taste like strawberries. Each of the fruit sorbets tasted like biting into a cold version of the fruit itself, the dark chocolate is rich and intense (they also have an extra dark chocolate one, which we didn't dare try). I may have to do a side by side tasting of their pistachio against Bulgarini, but at the moment I am actually leaning towards Grom. Overall: Excellence. 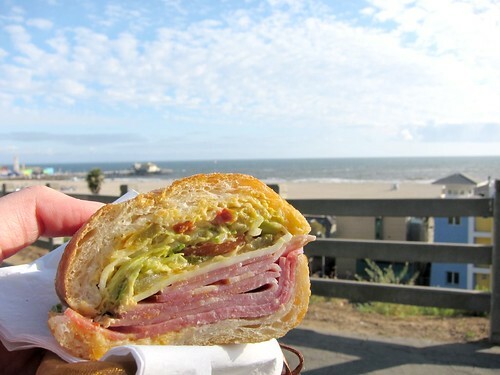 The only con for me is its location, all the way in Malibu. On the other hand, they are open until 11 pm on weekends, so you can make the drive at night traffic-free. I'd do it in a heartbeat. I've been to, and liked, Craft in Dallas so I was pretty happy when Craft opened up in LA. I've actually gone there when they first opened but never took photos, so when we went there again it's my chance to blog! We knew what we liked so we didn't get the tasting menu. Our meal started with a slightly spicy tartar amuse bouche. 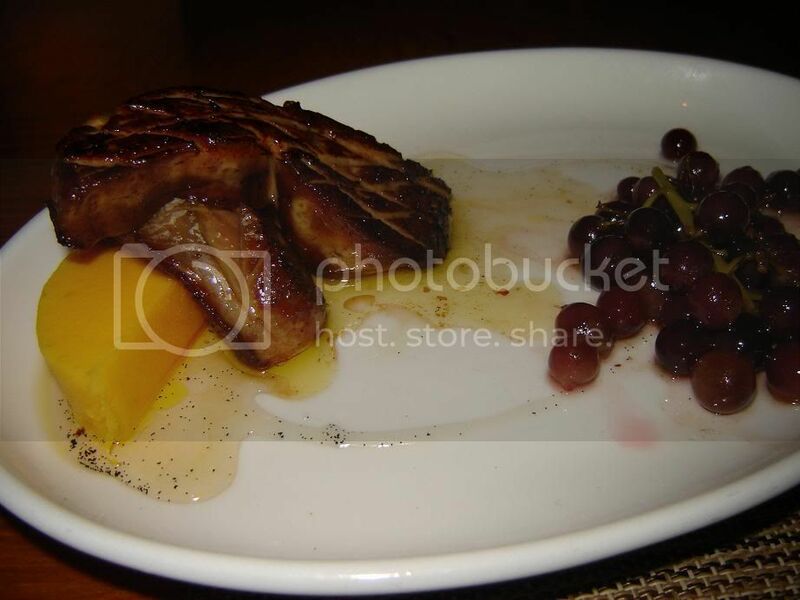 I tried out their seared foie gras with mango and grapes. 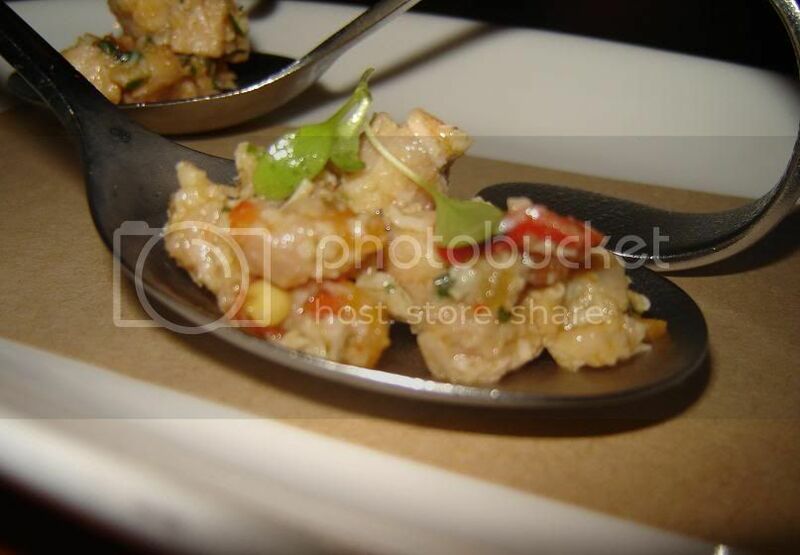 The foie itself could be better, but I did like how the tartness of the mango cuts the fattiness of the foie. 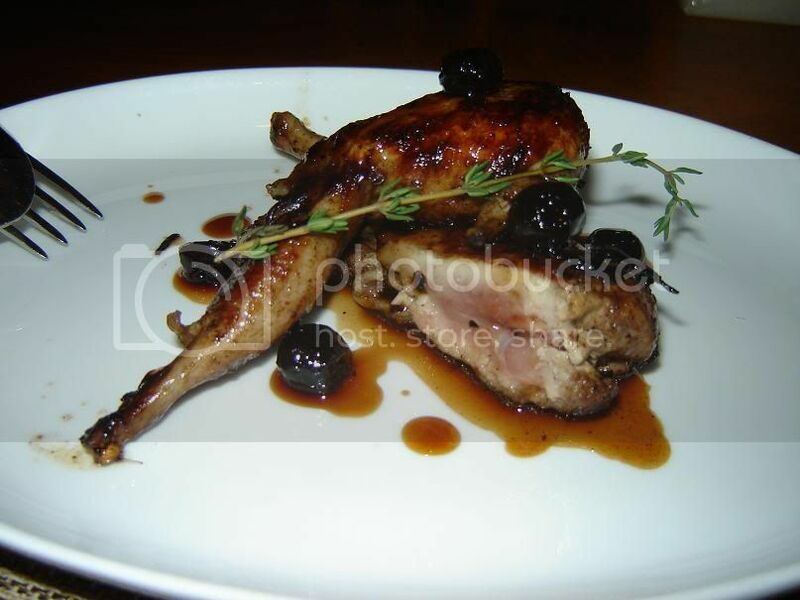 We also got the quail with blueberries, which I had in Dallas and really liked. 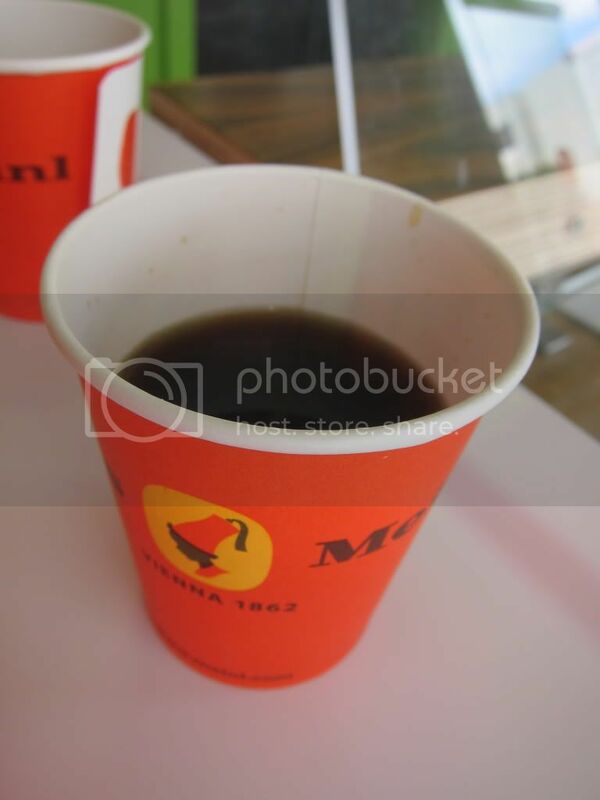 I must say the one I had in Dallas was better, and I think it was due to the bird itself. 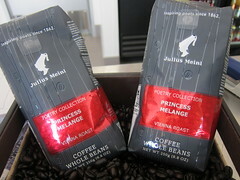 These are a little on the small side (considering it's $16) and not as gamey and flavorful. I still like the preparation with the blueberries, and I enjoyed it quite a bit, but having had a better version of it I was a bit disappointed. 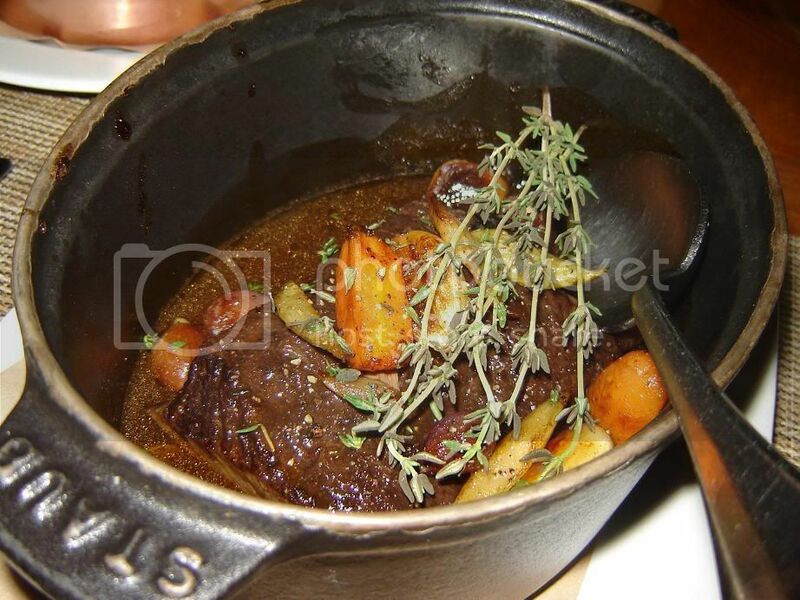 The short rib was tender and flavorful. I've had better short rib but this one is not bad at all. It's a nice, hearty 'comfort' dish. 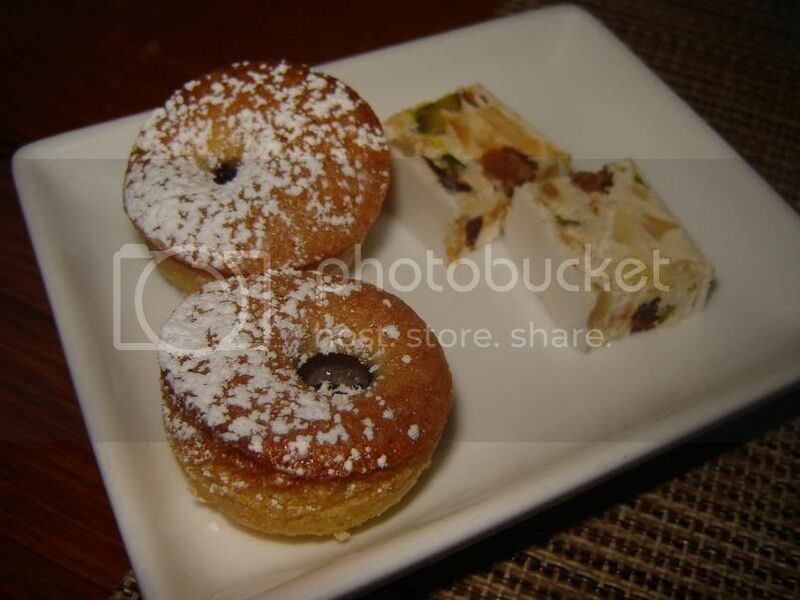 And of course side dishes are important when you're ordering a la carte at Craft. Side portions are generous and they have a nice selection. 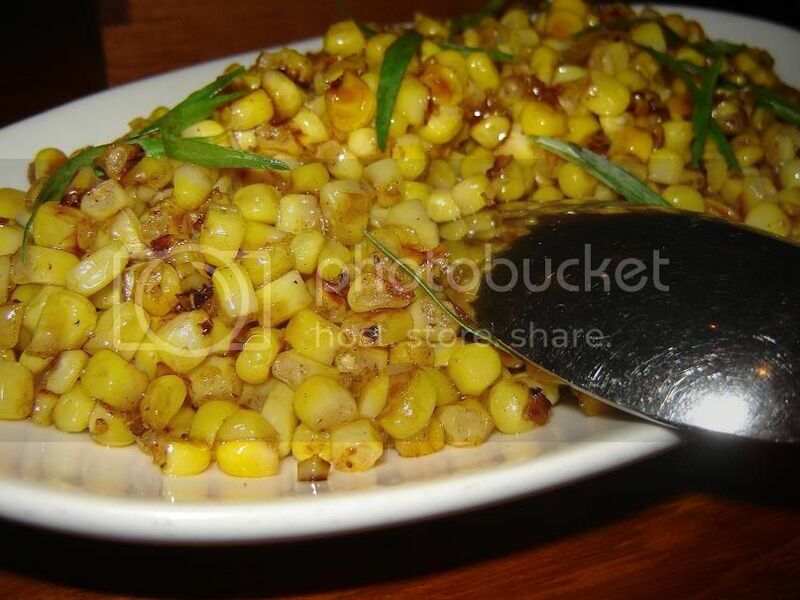 In case you haven't noticed yet, I love sweet corn. The corn was sweet with a nice texture. They were also not too oily. The other side dish we got was sweet potato, my companion's favorite. Pretty good and creamy. 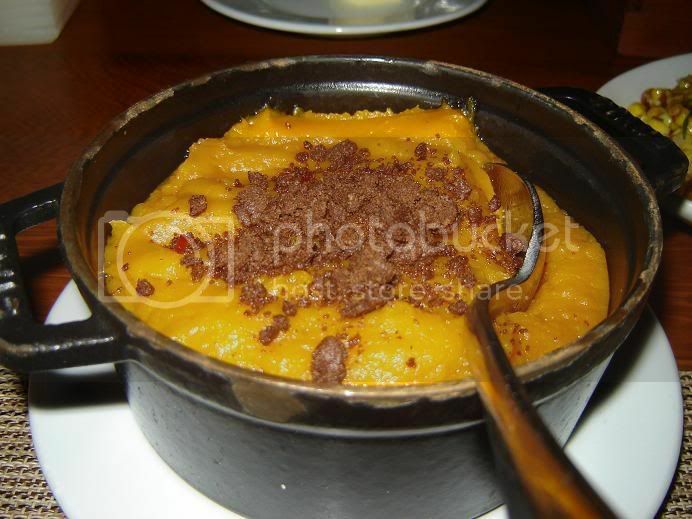 I'm not a huge sweet potato fan, so I can't say much, but I still enjoyed it. 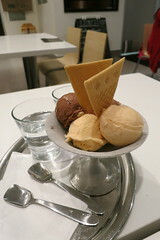 Now, the thing that really made an impression on me at Craft Dallas was their gelato sampler! The one here is more expensive! 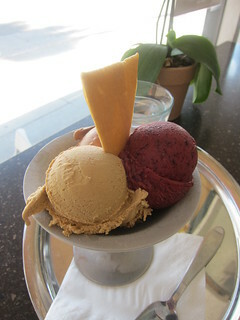 3 gelato/sorbet sampler for $10 or 6 for $20! 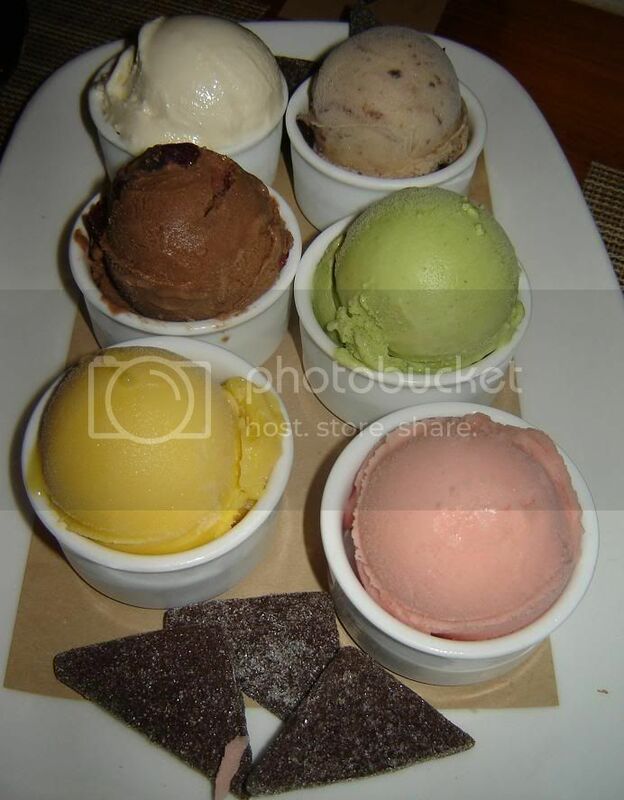 In Dallas we got 6 just for $12 *grumble* Granted the scoops are pretty big, but still .. 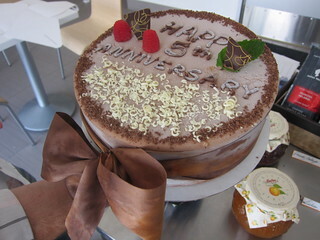 But we got the 6 anyway, which included chocolate, strawberry, concord grape, honey yogurt, and ... basil. The basil was one of my favorite! Unique, but very refreshing and delicious. Honey yogurt is another highlight. Instead of petit fours, we were served coffee cake and torrones, both delicious. I usually do not like torrone because they stick to my teeth but I enjoyed these ones. Overall I enjoyed my experiences at Craft LA and I'll come back again - but I know it could better. Because Craft Dallas is, and cheaper too. 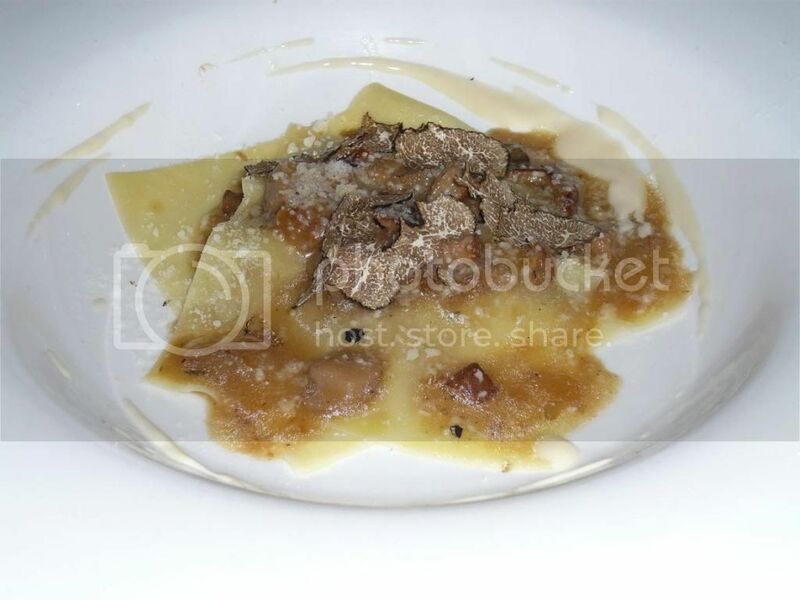 Last Wednesday Gino Angelini's La Terza bid farewell to summer truffles by holding a 7-course black truffle dinner. I thought for $75 this was a pretty good deal so of course I skipped class and went! The server took quite a while taking our drink order and giving us the check at the end, but at least the dishes came promptly and smoothly - much much better than the 5x5. Of course they are not nearly as crowded. 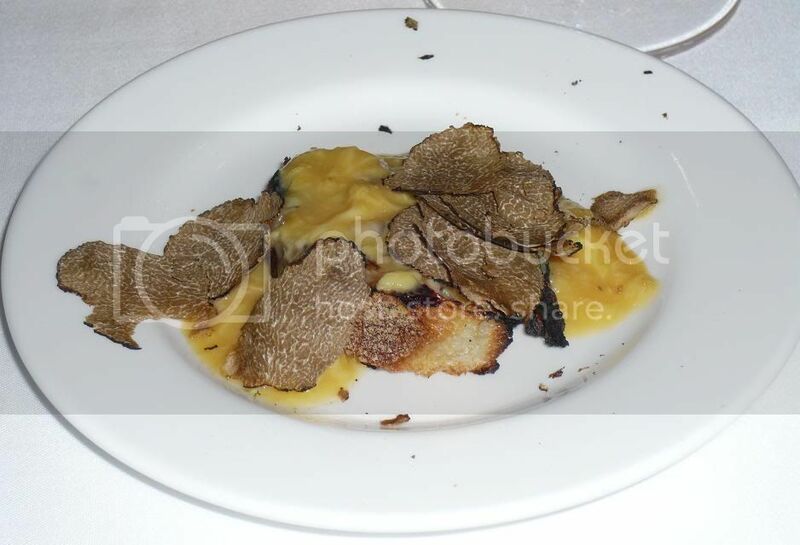 I guess Italians just like to take it slow ..
First course, we started with Scrambled eggs and black truffles I don't know how he does it but his runny scrambled eggs are always so delicious. The intensity of the color also tells you how great the eggs themselves were as an ingredient - full of flavor. An interesting flavor combination, with the citrus and the nuttiness (and slight crunchiness) from the pistachio. The truffles added to the nuttiness flavor. The roasted quail was great. A pretty gamey bird that was flavorful and juicy. 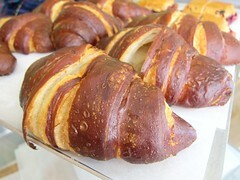 The skin is slightly crisped just the way I like it. 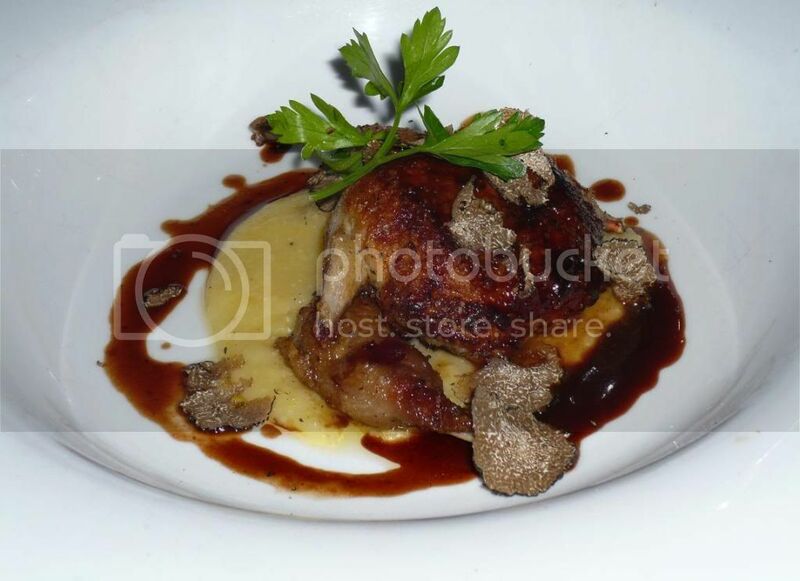 The black truffles seem to be an afterthought here though since the quail already stands out so much and frankly needed nothing else. 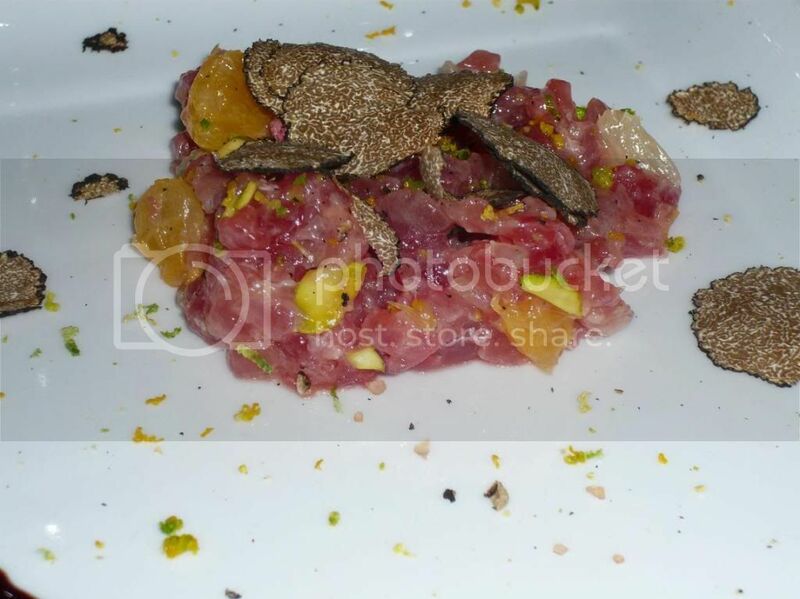 I think the truffles worked the best in this dish. 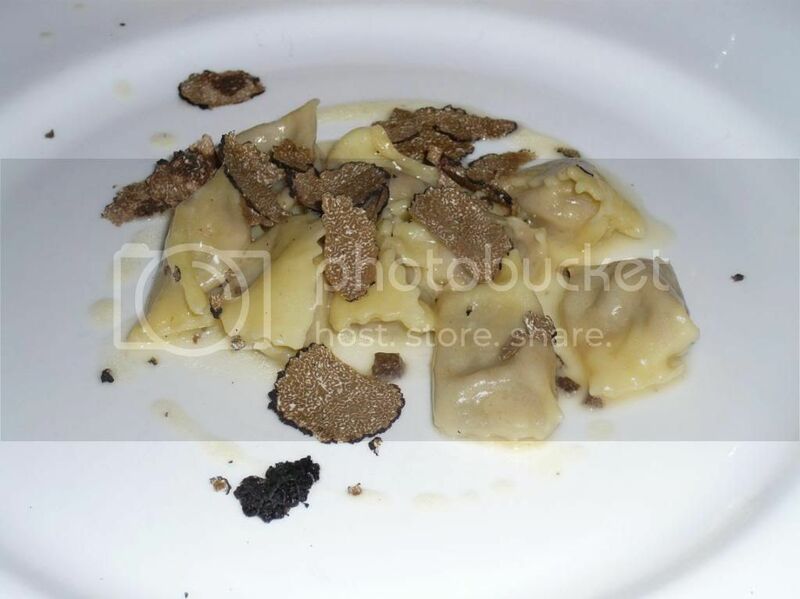 The combination of the truffles and the porcini mushrooms really make the flavors (and aroma!) stand out. This may be my favorite dish of the night. The veal shank inside was just absolutely ... oh I'm at a loss for words. Basically I wanted them to put a pound of this stuff in front of me so I can eat it up! Not only was it flavorful and juicy, the tenderness was wonderful. The shank juice mingling with the black truffles also enhanced the truffle aroma, making the dish as a whole work so perfectly. I liked the addition of the quail egg. Again here I felt the black truffles were just an excess addition - if it wasn't truffle night they could just serve this dish without them. 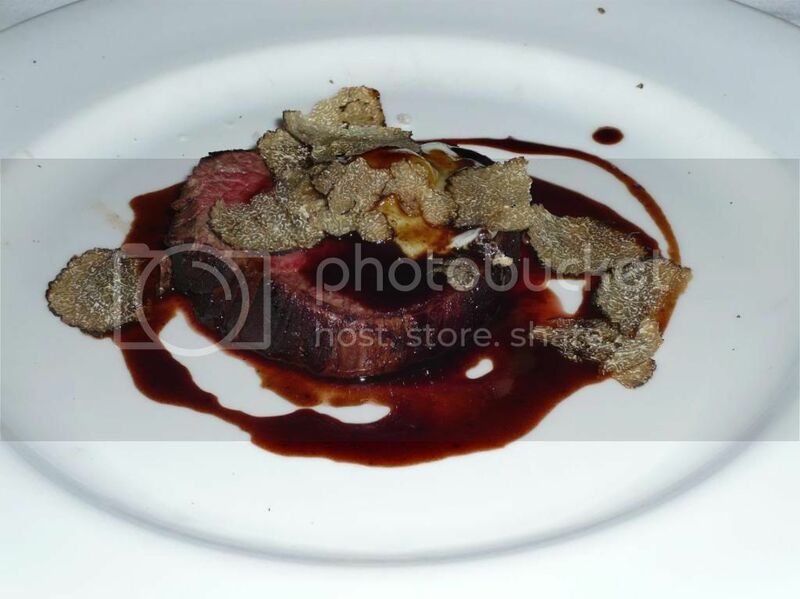 Not that I am complaining about the abundance of truffles in this meal, it just would've been amazing if the dish and the truffles work together better. I was skeptical of this at first, but as it turned out, black truffles on gelato is an awesome idea. Second favorite dish of the night. Or maybe third after the quail, I don't know. 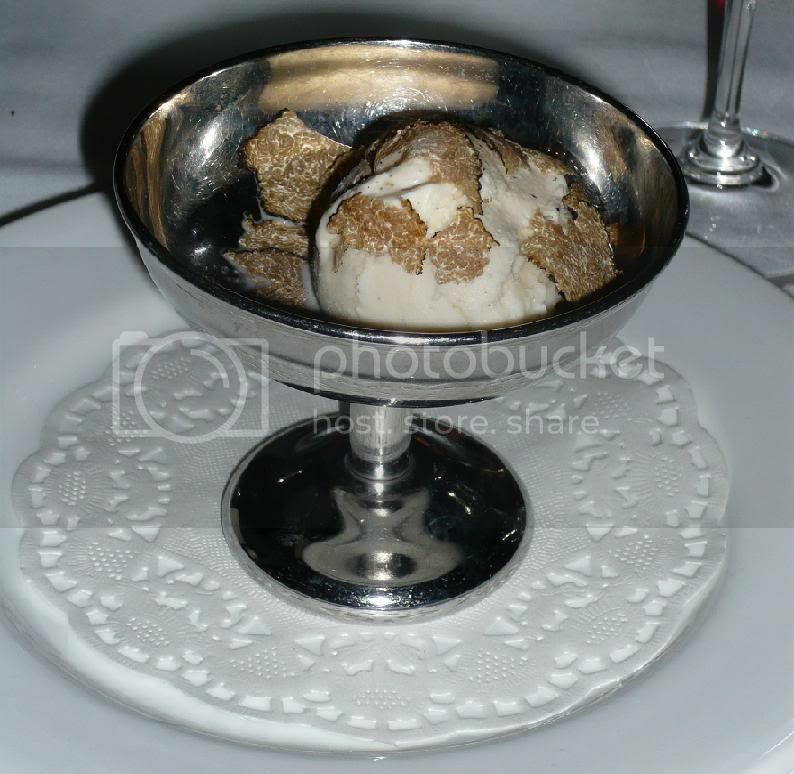 The truffle aroma actually really enhanced the flavor of the vanilla gelato. It's hard for me to describe it, but I will say that I absolutely loved it. And to think, this 7-course meal was cheaper than my one white truffle pasta dish at Angelini Osteria a year ago. I'll definitely be looking forward to more dinners like this one again! When I accept the fact that service at La Terza tends to be slow, I actually have a really enjoyable meal there.